If you are new to the whole gardening idea, you will find that unless the vegetable plants have a label on them, you don't know what you are looking at. It takes time and exposure to learn to identify which vegetable plants are what. There are a few ways of finding out just what the plant really is. Take the time to do a little research and soon you will be sure of the identification of most vegetable plants. Look up the name of the plant if you think you know what it is. The USDA has an interactive website that will allow you to input a name of a vegetable into its search engine to bring up all the information, including pictures of that plant. Be sure to specify that you are searching under the common name and not the scientific name, unless you know it. Print out pictures of the common vegetable plants and take them with you when you are looking at vegetable plants. 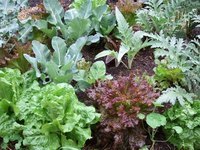 You can usually identify visually which plants are the vegetables you are looking for. There are some like tomato, potato and eggplant that are similar since they are all part of the potato family, but you can tell them apart by their blossoms and the leaves that are a little different. Ask someone who can teach you which vegetable plants are what. This is the simplest way, since they can look at them and tell you what they are. Then it is simply a matter of committing it to memory. Of course, there are some plants that you cannot identify just by looking at them. You might have to actually wait until they bear fruit to know for sure what kind of plant it is. This is true for melon plants and different kinds of beans. Take pictures of the plants and then search through a gardening book that has images of vegetable plants for you to compare them with. This will work well for plants that have established a good set of leaves. Seedlings are very hard to distinguish since they all start with such a simple leaf. Classify the plant by identifying its characteristics. Colby University has an online Flowering Plant Family Identification site that will help walk you through the different aspects of the plant until you get an identifying name. It will prompt you for the leaf layout, the texture of the stem, the number of petals and many other plant characteristics.